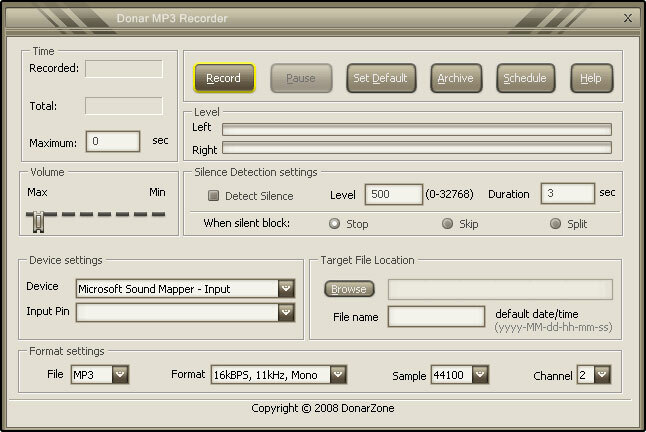 Donar MP3 Recorder is a flexible sound recorder software designed to capture any sound in real-time that goes through your computer (or comes from any other additional equipment such as Microphone, Cassette Tape, TV, Radio, Electronic Organ, Video Tape, CD Player, DVD Player).Just download Donar MP3 Recorder and let it do its job! You can save your recorded files into various popular types of format such as MP3, WMA, OGG, VOX, AU, AIFF. ...... VOX, AU, AIFF. Donar MP3 Recorder offers high quality recordings and a neat-looking, user-friendly interface. Qweas is providing links to Donar MP3 Recorder 3.0 as a courtesy, and makes no representations regarding Donar MP3 Recorder or any other applications or any information related thereto. Any questions, complaints or claims regarding this application Donar MP3 Recorder 3.0 must be directed to the appropriate software vendor. You may click the publisher link of Donar MP3 Recorder on the top of this page to get more details about the vendor.